top-half of the Mirror Chart. events and times of the symbolic 2300 years. 1. It is a fact that 2300 literal days (6 years -4 months -20 days), would not cover the duration of a single prophetic power in prophetic history, much less extend over them all. Therefore, the days must be symbols, even as the beasts and horns are shown to be symbols. 2. It is a fact that a symbolic day/prophetic day is equal to one solar year. See Eze. 4:5, 6 and Num. 14:34. Hence, the period is 2300 years which is called the day/year principle. 4. The angel has not yet explained the “manner of time,” or given its starting event (date) to the prophet Daniel. Gabriel did explain to Daniel at that time more than he could bear (verse 27), and at a later time he did make Daniel understand the vision. Dan 9:21-23. What is clear is the close connection between chapters 8 and 9, and thus the relationship between the 2300 days/years of chapter 8 and the 70 weeks (of years) of chapter 9. 5. 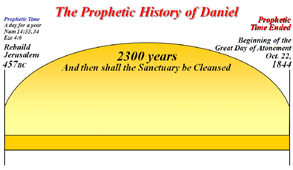 Daniel also knew that these prophecies were the promise of restoration, both for the sanctuary and for Israel, but that restoration was conditional upon Israel’s sincere repentance and the fulfillment of their part of the covenant. His prayer shows he understood this. Dan 9:2-19. 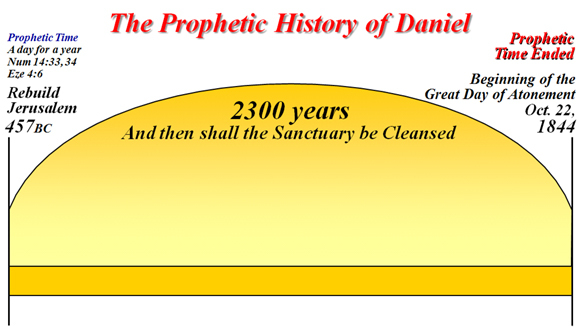 During the 2300 years is portrayed a number of events which answers the question “How long,” —with beginning events, ending events, and a very specific ending event, —“then shall the sanctuary be cleansed,” set-right/restored. Summary— The scripture above all others that was both the foundation and the central pillar of the Advent faith was the declaration: “Unto two thousand and three hundred days; then shall the sanctuary be cleansed.” Daniel 8:14. 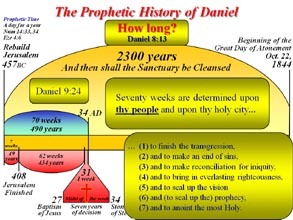 We can all agree that there are many events which are foretold in Daniel 8 and 9. 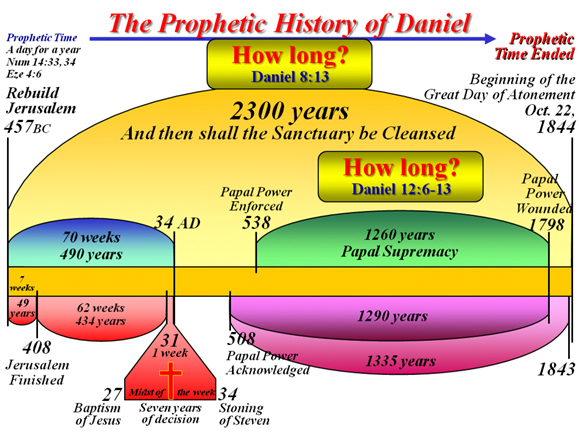 There are many more events to be found in the other chapters of Daniel (and Revelation) that fit into the 2300 time period, and which continue to fill in the picture. Fill in what picture? What is the most valuable teaching —the specific purpose— which we should learn from the 2300 day prophecy? It is all about Christ in the Sanctuary! It is all about the Plan of Salvation carried out through an understanding of the Sanctuary service! It is the prophetic time allotted to working out the plan of salvation in the earthy sanctuary, —and the prophetic time allotted to working out the plan of salvation in the Heavenly Sanctuary. The sanctuary in heaven is the very center of Christ’s work in behalf of men. It should concern every soul living today, for we are the ones who are to answer the most important question: What is the cleansing of the sanctuary? Please note: What is the main subject of contention in Daniel 8 and 9? What are the actions taken against that issue and against those who teach the Sanctuary truths? (For the next two groups of Scripture, only hover over the following links for pop-up explanations.) The following verses are from Daniel 8:10-14 and 15-19. 10 And it [the evil horn] waxed great, even to the host of heaven [God’s saints]; and it cast down some of the host [God’s people teaching the Sanctuary message] and of the stars [the leaders of God's people] to the ground, and stamped [persecuted] upon them. 11 Yea, he [the evil horn] magnified himself even to the prince [Christ] of the host [God’s people], and by him the daily [Christ free gift of salvation] sacrifice was taken away [hidden from the minds of men], and the place of his sanctuary [the Sanctuary of salvation] was cast down [made of none effect]. 12 And an host [evil people] was given him [the little horn] against the daily [Salvation through Christ as taught in the Sanctuary] sacrifice by reason of transgression [by sin living in the heart], and it [the evil horn directing evil men] cast down [make of none effect] the truth [the truth of salvation through Christ as taught in the sanctuary] to the ground; and it practised, and prospered [evil prevailed against the teaching of the Sanctuary]. 13 Then I heard one saint speaking, and another saint said unto that certain saint which spake, How long [how long will evil prevail against the teaching of the Sanctuary] shall be the vision concerning the daily sacrifice, and the transgression of desolation [a single act which starts this evil and leads to total destruction], to give both the sanctuary [the Cleansing Truth] and the host [God’s people teaching the Sanctuary] to be trodden under foot [persecuted]? 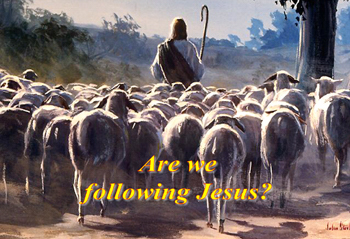 16 And I heard a man’s voice between [Christ, walking on the river!] the banks of Ulai, which called, and said, Gabriel, make this man to understand the vision. 19 And he said, Behold [Take note of this; I set you upright, LISTEN! ], I will make thee know what shall be in the last end of the indignation [The very last-days of the Great Controversy. ]: for at the time appointed [moed: solemn feasts--H4150--2Chron 8:13; In type, the Day of Atonement, Oct. 22, 1844.] the end shall be. Would we dare to think that the Sanctuary of Salvation has its only prophetic fulfillment during the 2300 years? 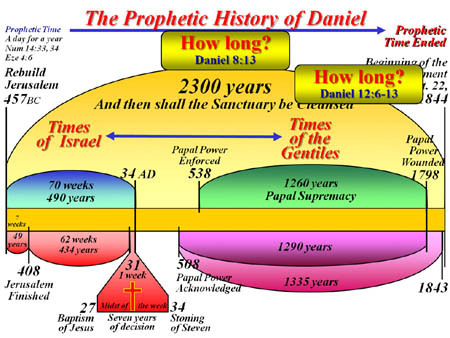 The 2300 years is the umbrella under which the other timelines of Daniel have their fulfillment. God’s great design in the plan of salvation is seen in the fulfilled prophetic history of the 2300 years and its all-inclusive timelines, —the 490 years; and the 1260 years, 1290 years, and 1335 years. The first group of timelines, the times of Israel, have their fulfillment in the 70 weeks, or 490 years, which were given to Israel for the fulfillment of the coming Messiah, Christ on the cross, as the Lamb of God. The purpose of the prophecy was to prepare a people for the coming of the Messiah. But Satan had made his way into the church and had effectively displaced in the hearts of the people the real reason for the coming Messiah, which was to be the Lamb of God, the atonement for the repentant sinner. Seventy weeks were given (as a probation) upon Daniel’s people and Jerusalem (including the sanctuary), 1) to finish the transgression, 2) to make an end of sins, 3) to make reconciliation for iniquity, 4) to bring in everlasting righteousness, 5) to seal up the vision, 6) to seal up the prophecy, and 7) to anoint the most Holy. See Dan 9:24. It would be good to note that Luke tells us that the disciples understood the times of Israel had ended (at the stoning of Stephen) and the times of the Gentiles were yet to begin in the future. How much of the details the disciples knew may be debated, but even though they knew the times of the Gentiles were yet future of their time, they still preached the nearness of Christ’s return! See Luke 21:24. 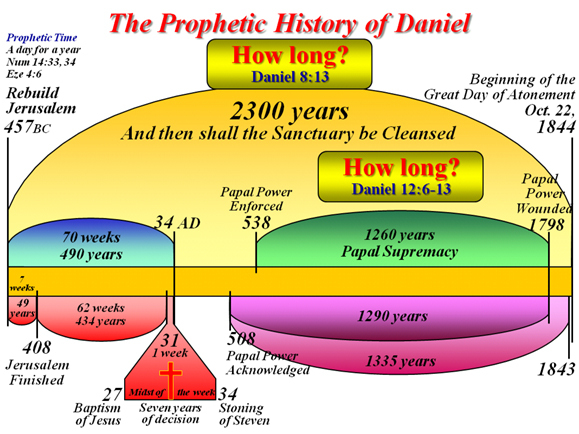 All three timelines are a prophecy that had their fulfillment in the Dark Ages of Papal supremacy, but the 1260 years is the central time period which marks the beginning and ending of Papal rule. 538 AD is the beginning date of the 1260 years. Three countries were hindering Papal supremacy and needed to be removed from power. The three horns plucked up by the roots represented the Heruli (493), the Vandals (534), and the Ostrogoths (538). (FS) With the conversion of Clovis (496), king of the Franks, the papacy found a strong army to champion its interests, and effective help in converting other barbarous tribes. By 538, the papacy was completely formed and functioning in all significant aspects; but by 1798, 1260 years later, it had lost practically all the power it had accumulated over a period of centuries. Inspiration allotted 1260 years to the papacy for a demonstration of its principles, its policies, and its objectives. Accordingly, these dates should be considered as marking the beginning and the end of the historical prophetic periods of papal power. There are many evil things that are recorded in Daniel and Revelation which were fulfilled by the Papacy during the Dark Ages. The Papal Church within the last few years has “apologized” for the murderous actions it took during the Dark Ages. I personally believe and can prove from Scripture that the Catholic Church Organization, if given a chance, will do the same in the near future. (Let it be clear: I love the Catholic people and I expect to be neighbors with many, many in the New Jerusalem. BUT, if the last-day prophecies come to fulfillment, and I have no doubt they will, the Roman Catholic Organization will again use the right arm of the state to trample upon God’s law and His people! We will study these timelines and their evil events against God’s people in more detail in the study of the Mirror Chart sections; 1260 years, 1290 years, and 1335 years. Chapters in Great Controversy related to 2300 years. Chap. 23 - What is the Sanctuary?